"This tastes like mom's Easter ham and has only a handful of ingredients! It's designed for 2, but you could alter it for a bigger ham." Cooking for two, I used one ham steak, quartered the recipe, and reduced cooking time by 10 minutes. Also used a sprinkling of ground cloves and a small handful of raisins. BEST HAM EVER!! The glaze was great. 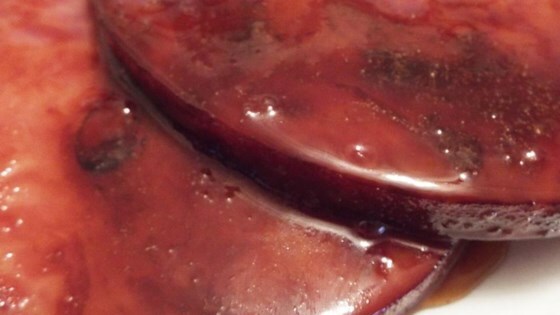 I used one large ham steak (the kind that Costco sells in packs of 3) and I cut the recipe for the glaze in half. It was plenty.